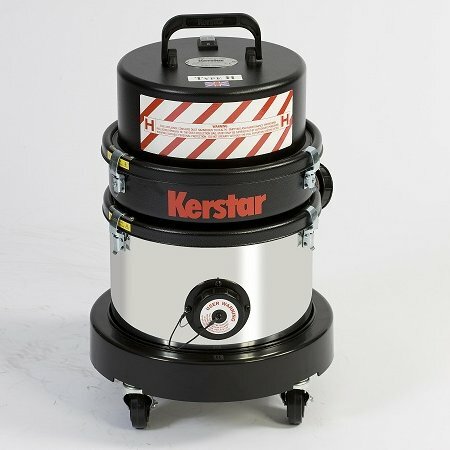 These Type H vacuum cleaners have been purposely designed and built to meet the needs of users to safely and effectively pick up hazardous dusts and debris. Examples of hazardous dusts include asbestos, finely divided silica, carcinogens and highly active pharmaceutical products. Each model in the range is equipped with three stages of filtration on the negative pressure (suction) side of the motor. The first stage is a sealable disposable paper bag, the second stage is a high efficiency cloth filter using a filter medium that is specially designed as a pre-filter material for HEPA filters. The third stage is an oversized HEPA (High Efficiency Particulate Air) cartridge filter housed in a sturdy replaceable module. Every Type H vacuum cleaner is individually DOP tested, on calibrated test equipment, to achieve a filtration efficiency of greater than 99.995%. All our Type H vacuum cleaners are supplied with 10 disposable paper bags and a spare secondary high efficiency cloth filter.